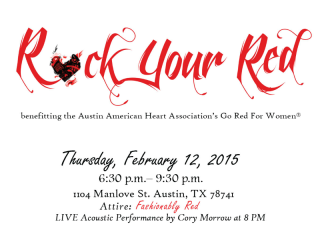 American Heart Association presents "Rock Your Red"
You're invited to attend "Rock Your Red" benefiting the American Heart Association's Go Red for Women Movement. Guests will enjoy live music from Cory Morrow, Deep Eddy Cocktail Bars, wine by Barefoot Wine & Bubbly and gourmet bites provided by Ranch 616 chef David Garrido. The Red Dress Collection SM at New York Fashion Week will be streaming live throughout the evening. The event will be hosted a private residence. Check out the Facebook event page for more information.